I’ve been writing a lot on feedback recently (See here, here and here for some of my recent feedback thinking). One of the reasons for my recent focus on feedback is because it’s such a simple yet powerful tool for improving performance. As I’ve been quoted saying previously: “feedback is probably the most cost effective performance management tool available”. Delivering great feedback is cheap, easy to learn, and there’s no shortage of expert advice out there on how to do it well. But still nearly 65% of employees want more feedback than they’re currently getting. So it’s clear that there’s still a lot of room for improvement. As a result I’ve been digging through some of the recent research on workplace feedback for practical insights. The piece that follows below isn’t a beginners guide to feedback (see here for the 101 guide to giving better feedback), but what I’ve done here is highlight a range of facts on workplace feedback. These are interesting discussion points that you can use to get your managers engaged in a broader discussion about just how powerful feedback can be. When receiving feedback, employees don’t separate the content of feedback from the person delivering it. In other words, there’s no such thing as valuable feedback from someone that you don’t trust. Before any feedback will be effective, the recipient must see you as a credible source of development advice. Critically, the person you’re giving feedback to must believe you have their interests at heart. If not, your feedback won’t be effective in driving behavioural change – no matter how well intentioned. It’s easy to think that the role of negative feedback is to educate your employees on issues that haven’t come to their attention. But most of the time, that’s just not the case. In a study of nearly 4000 people who had just received constructive feedback, 74% of respondents indicated that they already knew about the problem and were not surprised to get negative feedback. Most often, it’s not that employees aren’t aware of the issue – it’s that they don’t know how to respond. So just pointing out that they have a problem isn’t enough to be helpful. To improve performance, constructive feedback must go one step further and provide specific feedback around potential causes and solutions. This is somewhat counter-intuitive: Many people typically about the feedback conversation as an almost one-way discussion where the manager provides advice and guidance. But as the data shows (see below), more time spent listening has a strong payoff. 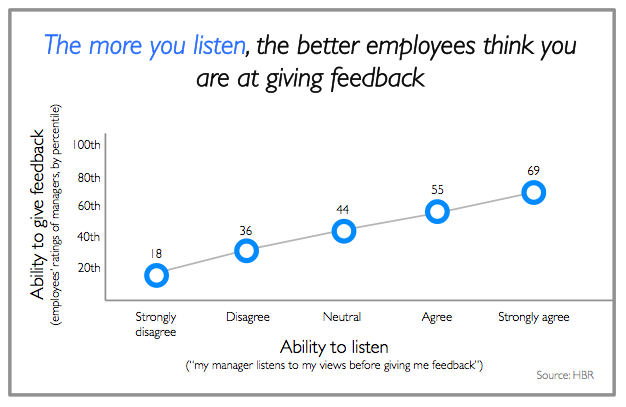 The more you listen to employee views before giving feedback, the better the employee experiences and understands the feedback. It’s all about making sure employees understand and agree with the basis of the feedback, and buy into the course of action. A majority of employees prefer corrective feedback to praise and recognition. In this survey of 900 global employees, 57% of respondents stated that they prefer corrective (negative/constructive) feedback, whilst only 43% stated that they prefer praise or recognition. 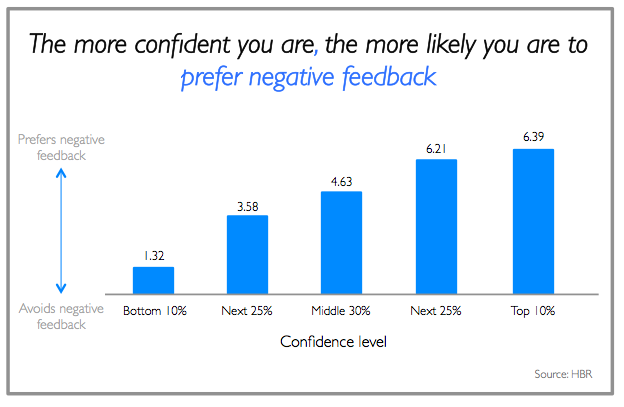 Interestingly, the more confident you are, the more likely it is that you prefer corrective feedback. As clearly shown in the graphic below, confident individuals are more likely to prefer corrective feedback relative to positive praise or recognition. It turns out that most people like getting feedback a lot more than they like giving it. As shown in the visual below, most employees love receiving feedback (especially of the constructive variety). 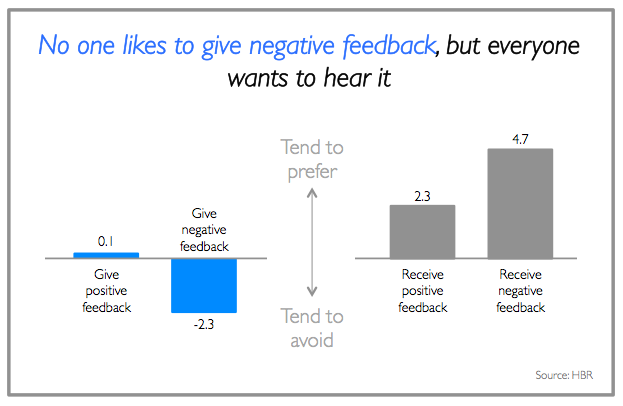 However, the same employees tend to dislike giving feedback (again, more specifically negative feedback). 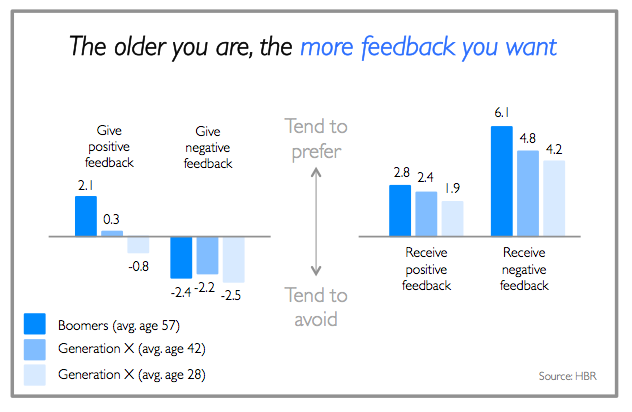 Older workers have a preference for both more positive and negative feedback than younger generations. As shown below, older generations were also much more likely to give positive feedback. Whilst this is interesting and provides a strong counterpoint to the millennial feedback myth, it’s worth noting that the research didn’t control for rank or role – so some of this effect is likely to be explained by seniority. Recent research from London Business School shows that star performers need more positive affirmation after setbacks. Researchers looked at the performance of top talent after they’ve had a major setback that involves loss of status. The findings show that when previously high performers lose status, their performance suffers. And the very best performers suffer the most. The mediocre performers, by contrast, barely suffer at all. The research also shows that it was possible to mitigate the effects of this performance drop with targeted affirmation. The academics suggest that this reinforces just how important it is to give your star a break after they’ve bungled something or lost face. As a manager, you have a critical role here in helping your star performer regain status by letting them know how you value their work. When giving positive feedback, it’s important to praise effort rather than ability. Stanford psychology Carol Dweck has showed that focusing individual praise on talent rather than effort leads to poor performance. In a number of studies, Dweck has showed that praising individuals for their natural talent leads to increased risk aversion and those individuals exhibiting being more disturbed by setbacks. This contrasts with individuals who are consistently praised for their effort (rather than ability). These individuals are more likely to build determination and resilience, leading to better performance over the long term. 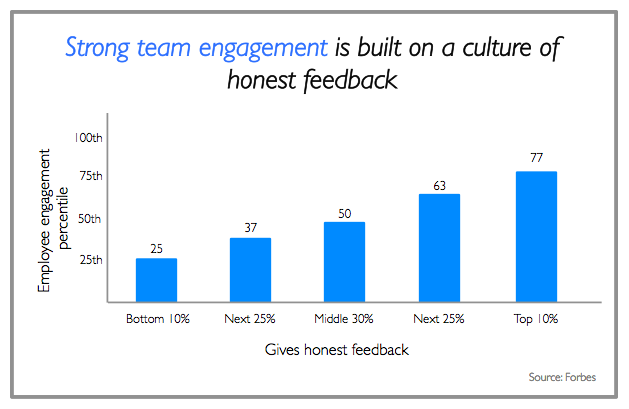 This recent study of over twenty thousand leaders showed that strong team engagement is built on honest feedback. In the study, leaders ranking in the bottom 10% of feedback givers saw team engagement scores that averaged just 25 percent. In contrast, those leaders in the top 10% for feedback giving saw team engagement scores average 77 percent. Most of us know from our own work experience that specific feedback is significantly more helpful in improving long-term performance (compared to general platitudes). 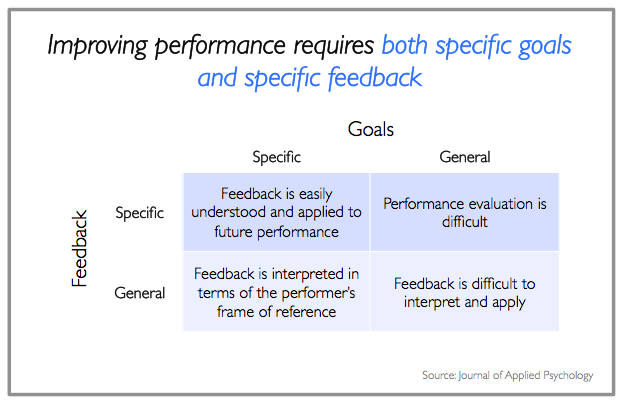 But it turns out that specific feedback isn’t helpful unless you have specific goals as a frame of reference (see the visual below for easy explanation). Fascinatingly, the most motivating kind of feedback is finding out you’re just behind someone else. It’s most motivating knowing that you have the chance to ‘win’ (but aren’t currently doing so). This research study showed the power of following up feedback in improving long-term performance. Significantly, it seems that the more action you take to follow-up and truly understand feedback, the larger the performance improvement. The reason you withhold feedback isn’t to protect the recipient, it’s to protect yourself. In this research study led by Carla Jeffries, researchers tested how the content of feedback changed based on the medium of delivery (face to face or anonymous) and the self-esteem of the person giving feedback. 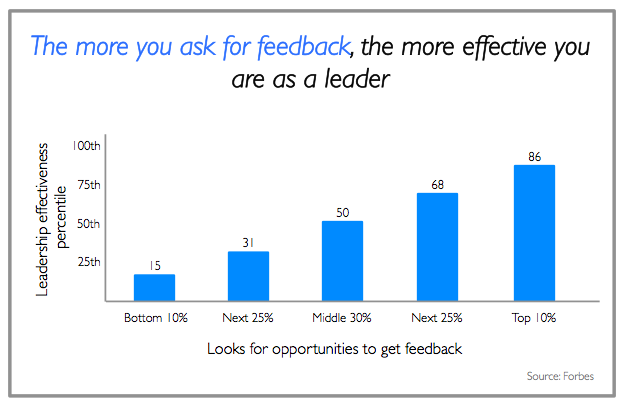 Leaders who ask for feedback are significantly more effective. In this study of leadership effectiveness across 51,896 managers, there was a strong correlation between the tendency to seek feedback and leadership effectiveness. Leaders in the bottom 10% of asking for feedback were also rated in the lowest 15th percentile in overall leadership effectiveness. Leaders in the top 10% in asking for feedback were rated in average in the top 14% for leadership effectiveness. Improve the quality of feedback with this easy to use online 360 feedback tool. Avoid counter-productive feedback with this simple list of items to avoid. Regular check-ins improve the feedback process. 10 TED talks on best-practice performance management The science of feedback: Is more feedback always better?